Next time you feel overwhelmed and decide your life needs some direction, just take a look at Matt Ghaffari. Everyone remembers the wrestling. The popular heavyweight was the anchor for those USA Greco teams of the 90’s that helped re-establish the style’s place in this country. There were the uphill battles against Russian destroyer Alexander Karelin, the World medals, the Olympic silver, and numerous other titles. They are all important, each examples of how the Iranian-born American plied his trade. But people need “human”, they need flesh, blood, laughter, and tears. They need something, someone to identify with. Ghaffari was there to provide that, too. That’s why it is never as simple as associating what happens on a mat with the plasma of those in battle. We tend to think we know someone and have a bead on who they are based on performance. There is some credence to that. Absolutely, wrestling can reveal the power of a person’s pulse. But it doesn’t show you the machines at play behind the curtain, the struggles you endured to get there and the victories won in offices and classrooms. Referees don’t usually show up at your home to award points because you make sure your family is taken care of. Medals aren’t given for the successes, be them tiny or monstrous, which are achieved on a daily basis. That’s okay, too. Ghaffari didn’t need those. Instead, he goes after life the same way he did competition — willing to pay the price. 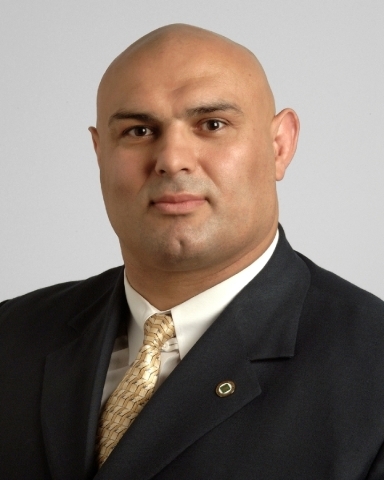 Aggression, endurance, and opportunistic technique served Ghaffari well as a world-class competitor and those attributes are certainly evident following his wrestling career. He also never ceases being an open book. He wants YOU to know about his life partly because he’s rightfully proud but also, because he’s interested in letting you know there isn’t exclusivity to his achievements. You can do it, too. You can be Matt Ghaffari. 5PM: A lot of people may not know this, but one of your most impressive achievements is that following your wrestling career, you earned your MBA. What was your motivation for going after your Master’s? Matt Ghaffari: I had my college degree before the Olympics but after that I had to reinvent myself to join the work force, and an MBA was the next step for me. After Atlanta, my family had grown from three to five, so I had to go to school to provide for my family. 5PM: What exactly is your current career field? MG: I am the Business Management Development Director for OSPORTS, a division of Osborn Engineering, which is 125 years old next year. We do architectural engineering for sports arenas. My company was the original architect for Fenway, Yankee Stadium, Michigan’s “Big House”, Notre Dame, Ohio Stadium. It’s a very rich history and right now my division works on renovating stadiums, gyms, wrestling rooms, weight rooms, and swimming pools. We work with the best coaches and athletes so they can get architectural design that works for sports. Plus, I’m around sports that I enjoy. My company has a rich history like the Olympics. I get motivated externally. I have done everything I could possibly do by going to the Hall of Fame. There’s nothing more I can achieve in my sport, I’ve achieved all honors. Aside from winning a state championship in New Jersey, but life is good (laughs). 5PM: When you first came over to America from Iran, did you find the transition in that era, that generation, particularly tough? Did you face any kind of discrimination? MG: No, no, no. Learning to speak the language was the most difficult part. But sports gave me the venue to bond and make friends. I never had any kind of political affiliation and thank God because of my size, people were always nice to me. 5PM: Let’s talk about your start in Greco Roman wrestling. This is an interesting aspect of your career. MG: Coach Savage, my high school coach, would take us to summer tournaments in New Jersey. There were less people showing up for Greco, which meant I was making it to the finals when I was learning. I only wrestled my junior and senior years. My medals in the state of New Jersey were in Greco more than freestyle. It was upper-body, plus I had bad knees from playing soccer. I was just natural at it with my upper-body strength. 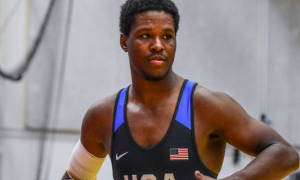 5PM: When you graduated to the Senior level of competition in this country, how did you come to realize that becoming an Olympian was a realistic goal? MG: In the 1980’s I tried out for the Olympics but it was a boycott year and I was in the top six, but you know, I wrestled at the the Olympic Trials, Junior Olympics, AAU’s. I almost didn’t make it to my high school graduation because I was in Chicago at the National AAU tournament and my flight was delayed. I almost didn’t make it to my graduation ceremony. Wrestling was my focus, it was an important thing and I tried again at the AAU Summer Olympic Trials. In 1984, I was the alternate at the camp, the first alternate, and Coach Gable told me that if anything happened to Bruce Baumgartner I had to be ready. So I was the Olympic alternate behind Bruce in ‘84 and ‘88. In 1989, I switched over to Greco 100%. 5PM: As you look at Greco Roman wrestling in the United States, what do you think needs to be improved? 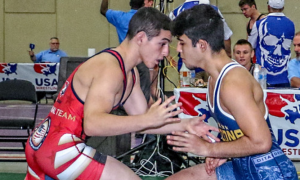 Matt Ghaffari: They need to get kids to do Greco in college. People receive room and board to basically study college freestyle. So if you put it in the simple analogy of baseball, college is the minor league for Olympic freestyle. All of the greatest freestyle wrestlers came from colleges. But Greco, we have nobody. 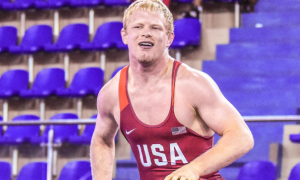 So you go from doing college wrestling to switching to Greco. 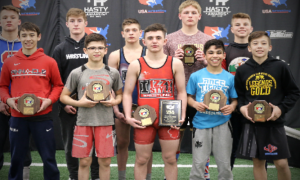 We need to have Greco wrestling with room and board scholarships so people can study what they want to study and train all year ‘round. We have a program in Marquette at Northern Michigan, that’s the only place. But that’s the downfall of Greco in this country. There is a residency program available, but people can’t bypass their college scholarship and the sexiness of being a college and freestyle wrestler, they’re more popular. Ghaffari (red) holds onto Billy Pierce at the 2000 Olympic Trials. 5PM: How do you like this year’s heavyweight, Robby Smith? MG: Yeah, he’s going to medal. We should have three medals out of our guys. I’m very familiar with everybody. I was at the Olympic Trials, I was going to talk to you then (laughs). 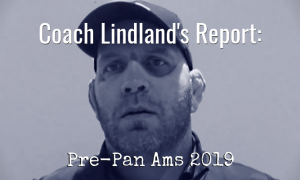 I know the team, I know Matt Lindland, the national coach, I am in contact with Chris Saba. We have a very good team, we are very optimistic. It all depends on your attitude when you get the draw the night before. Because the night before is when medals are decided, that’s when you know who’s tough, who you want. 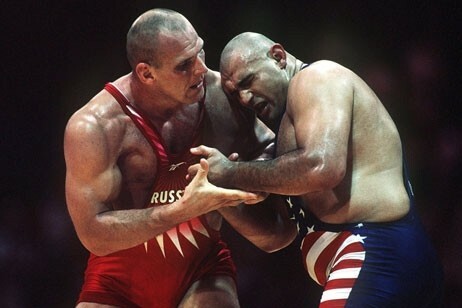 I wrestled Karelin, if he was on my side I won a bronze, if he was on the other side, I won a silver. Every time I went to weigh-ins I said, “I don’t want Karelin.” And then in Atlanta I didn’t pick, it was all decided. I waited and that was it. In Barcelona, I picked. So it’s the luck of the draw, it’s what you tell yourself when you know who is going to be your next two matches or your next three matches. 5PM: As an Olympic-level athlete, how have training methods changed compared to when you were competitive? MG: There’s more sponsorships and funds available from USA Wrestling as a stipend. There’s also specific weight training, Olympic-style ballistics, Crossfit-type, ultimate fighting-type, to give you the endurance you need. There is a lot of evolution in the technology, sponsorships, and health. Right now if you get a gold medal it’s $250,000 and $50,000 for silver. I was lucky to get my shoes. After 1996, it was, “You’re on your own, son, good job!” Life has changed, but it should be like this. 5PM: Yeah, considering the US doesn’t have a state-sponsored program. MG: Yep, we’re the only country that doesn’t get funding from the government. 5PM: Obviously, a lot of people tie you and Karelin together just like they do with Gardner. You came so close at the 1996 Olympics, but that wasn’t the end of the series for you and him. Matt Ghaffari: In 1998, I wrestled Karelin in the finals of the World Championships one last time and it wasn’t as close as Atlanta, but the rules had changed. He wasn’t happy that we were close in Atlanta and he let me know he was scared in that final. I knew I had him. That’s also when I knew Rulon Gardner could beat him in 2000, and I predicted it in USA Today three days before that Rulon was going to beat Karelin. Karelin would not be the Olympic champion. 5PM: Do you think you played a role in exposing Karelin’s vulnerability? MG: Oh yeah, I knew I could beat him, and that’s what I told Gardner at the Olympic Trials. With the new rules in the clinch, I knew I could beat him. And Gardner beat me, and I was a gold medalist in my mind. Yes, I mean, every year as you get older with injuries, you are more vulnerable. I had good matches with him and I knew I had his number. Right before 2000, in 1999 there were a bunch of tournaments and he (Karelin) didn’t come because he was saving himself for the Olympics. Every dog has his day, basically. 5PM: When you came back in 2010, how did that all get started? MG: The resident coach, Anatoly Petrosyan, and I had a bet that I couldn’t make 120 kilos. So I made the weight and I trained hard to make it, so he said, “Well, you made the weight, you have nothing to lose, so go wrestle.” That’s how it got started. 5PM: How did you feel physically at 48 years of age? MG: I didn’t think of my age because I don’t drink and I don’t smoke, I’m healthy. I trained how I used to for the Olympics. Mentally I knew I could do it, but physically I was slow and the new rules at the time was micro-match style of one and half minutes and then two more 90-second periods. They were much smaller matches basically. 5PM: Is that one of the reasons why you didn’t continue on after that tournament? MG: No, it was a one-time thing. I mean, when you’re training and and you’re beating college kids because they don’t do Greco, you have a false assessment. I never lost to Japan before and once I lost to Japan, I knew my time had passed. 5PM: You had a couple of MMA fights. If that sport was around when you were younger and competitive, would you have gravitated more towards it? MG: Yeah, I trained with Randy Couture, Matt Lindland, and Dan Henderson, those are all my teammates. And I most likely would have focused on it if I didn’t have a wife and kids to provide for. I want to say I would have done very well at it. The conditioning is the key. MMA is a natural attraction. 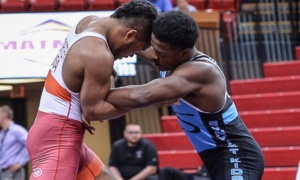 There is no pro Greco Roman wrestling, and wrestlers do really well. I coach a lot of athletes who wrestle who should do ultimate fighting because they would do well. It’s the technique where a boxer cannot hit you if he’s on the ground, it could only be on his feet. On the other hand, a jiu jitsu guy can’t do anything unless he’s on his back or in the guard position. So if you pick him up and slam him down a couple of times, you knock the wind out of him. The wrestler is the only complete athlete who can do all of it — throw, fight on the bottom, fight on the top. The only thing it would take us to learn is the kicking. Kicking is big-time because you’re balance is off every time you lift a leg up. No one knows, but I had a lot of knee surgeries and that’s when I got into the coaching part of it and the fighting part of it. In 1984, my roommate at the Olympics was Dan Severn as an alternate. He was a 220 lbs alternate. Dan and I are good friends and he was the first hall of fame wrestler and a King of the Cage, so we talk a lot. Ghaffari is currently a Business Development Manager with OSPORTS, a division of Osborn Engineering. 5PM: During your career, you traveled quite a bit overseas on tours and such. What were some of your favorite countries to visit? MG: When we wrestled I was too focused on competing to enjoy the countries. It’s hard to say. I can tell you that if I won, that trip was a good trip. If I lost, it was a bad trip. In Cuba, I never lost, I was double gold in freestyle and Greco. 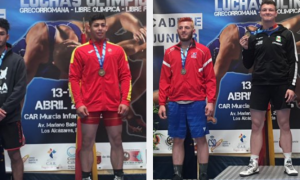 Even at the Pan American Games, Fidel Castro came and they moved my match from last to first because out of ten wrestlers, they thought I was the only one who had a chance to beat the Cuban. That way, Fidel Castro would see the big sweep of nine goals in a row. You know, it shook me up a little bit, moving me from last to first. We had a really good showing. Randy won a gold, a lot of people won gold medals. But the Cubans were thinking that they were all going to lose and that I was the only one who was supposed to win. If you were to ask me where would I like to go visit? Sweden, Finland, and Norway have good Greco tournaments and I always went there during the winter when the sun would only come up for two hours. I had a lot of relatives and friends who only wanted to go there in the summertime. France was historical but I never got a chance to go the museums, we were always training at their Olympic training center. It was like 60 minutes outside of Paris and we would take the train. We’d tried not to get tired but on our days off we liked to rest. Every country has its good parts and its bad parts, it depends on what you’re looking for. I’d spend a lot of time researching what were the best gyms, who I knew. I had the Rotary Club of Sweden at the World Championships. They would pick me up, take me shopping because I didn’t have a car there. Everybody was like “Wow, he’s organized!” And at that time, there wasn’t email. It was a lot of calling the wrestlers and finding out who speaks English, who could help you, things like that. Every country I had fun. If you tell me where you don’t want to go, I say I’ll go to all of them again. People told me that Sofia, the capital of Bulgaria, was dirty. I stayed there and trained with the heavyweight for six weeks. I thought it was a great, great city, you know? Every city I have been to, from Hawaii to San Diego, has been awesome. I can’t tell you which one is better than the other. Barcelona, I didn’t do good there at the Olympics. But in 1991, we went there for some tournament on a scouting trip, and I loved it. I would go visit it again. It was artsy, gaudy, and interesting. In Atlanta, I won my medal and my brother lives there. Every time I go to Atlanta, I get excited, I get happy. I go visit all of the Olympic sites. I don’t know, that’s a rough question for me because I was born in Iran. I loved the country I was born in, but I also haven’t visited there in 38 years. Every country has its good places and bad places, and it depends on what your interests are. 5PM: You’re like a citizen of the world. MG: Yep! I was the Mayor of Olympic-Land, that’s one of my titles. 5PM: What would you say to young wrestlers out there who want to follow in your footsteps and attain World and Olympic-level success? Matt Ghaffari: I would say to the coaches and to USA Wrestling, that if someone told me just to do Greco I probably wouldn’t have wrestled. I did both freestyle and Greco for a long time. At three nationals I’d win in Greco but I’d lose to Baumgartner or (Tom) Erickson. I say just go wrestle. Have fun. College, Greco, freestyle. Don’t try to win every match 1-0 or 2-0. If it’s the finals of the NCAA or the Olympics, technique still wins. If you lose 8-9, it’s much better than winning 1-0. You don’t learn that way. Also, don’t be afraid. Try new techniques and go wrestle. And the more you wrestle, you will find you way, your passion.